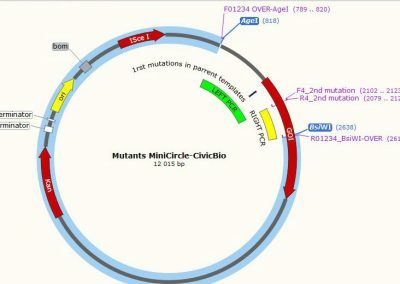 Generate double mutants in a minicircle vector with contains very few unique restriction sites. 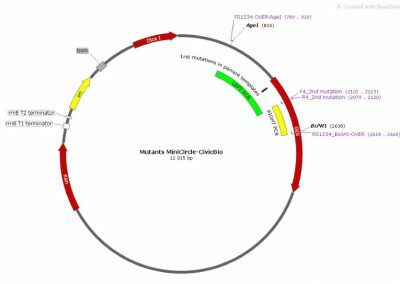 The goal was to combine mutations in a minicircle vector coding for the genes of a Human Papilloma Virus Strain. 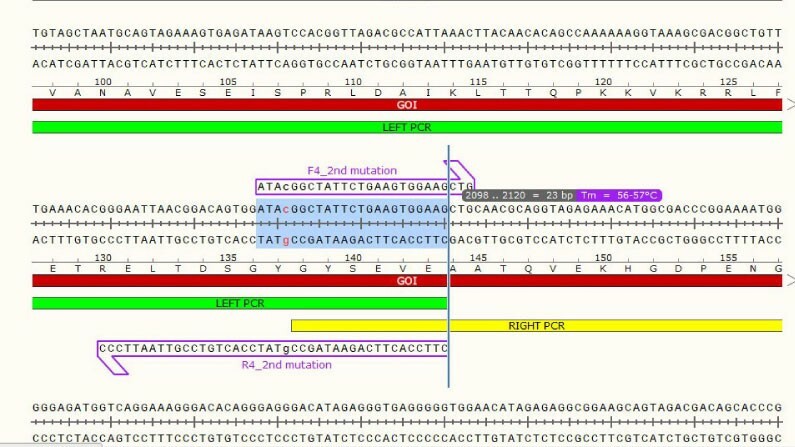 The researcher supplied us with 3 single mutant vectors, in which we needed to introduce a downstream mutation that would abolish the start codon for a second gene encoded within the first gene but in a different reading-frame. 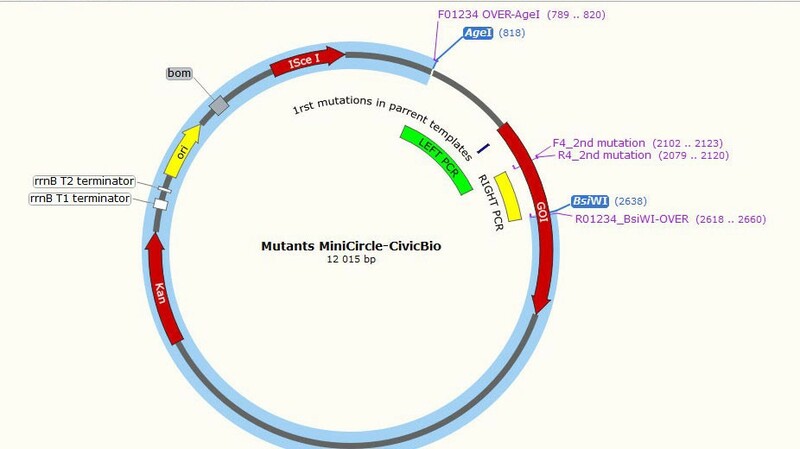 Minicircle Vector Restriction Digest with BsiWI and AgeI. To maximize the chance of achieving full parental DNA digestion, we recommend performing a first digestion in 50 ul for 1h followed by DNA clean-up. 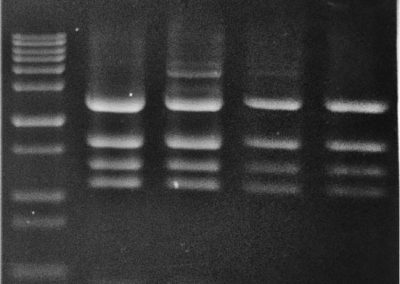 Then, a second identical digestion for 15min, followed by agarose gel electrophoresis and gel extraction. Follow the instructions of FavorPrep GEL/PCR Purification Kit or FavorPrep MicroElute GEL/PCR Purification Kit and elute the DNA in 40 ul EB buffer. 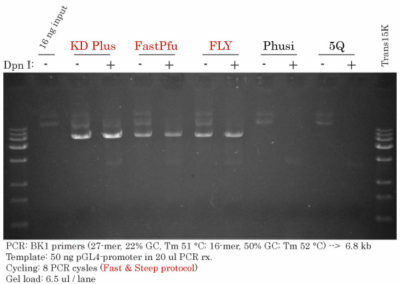 Mix 10 ul of 6x DNA loading buffer with your sample and load on a 0.7 % agarose gel prestained with GelStain. 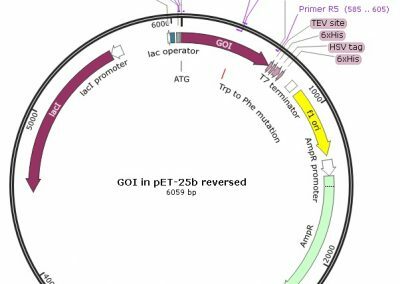 Cut out the band using a clean razor blade and follow the instructions for FavorPrep GEL/PCR Purification Kit. 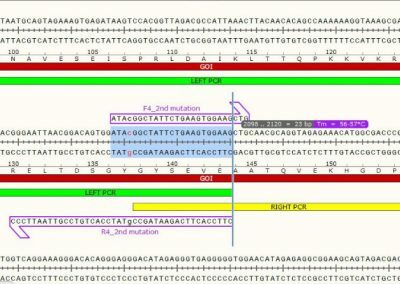 Elute the DNA in 40 ul EB buffer. 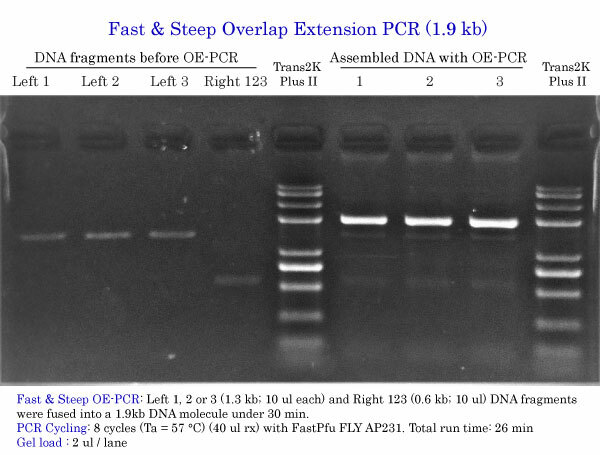 The 3 gel extracted and purified overlapped DNA fragments, containing either three of the first mutation and the 2nd mutation we’ve introduced, were cloned using pEASY-Uni Seamless DNA Assembly mix. We can provide Unlimited plans that include Chemically Competent Cells. Thaw 50 ul of cells on ice. Heat Shock for 30 s at 42 °C in a water bath. Put on ice for 2 min. Add 450 ul of room temperature SOC or LB media. Shake at 200 rpm at 37 °C for 45 min. 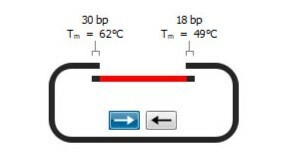 Spread 200 ul on a pre-warmed kanamycin-selective LB-agar plate. 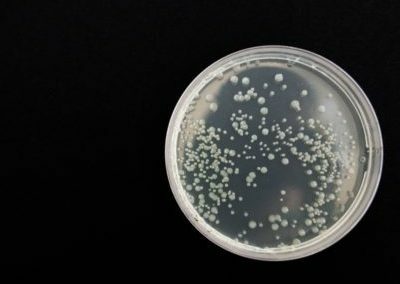 * We typically spread 60-100 ul on LB-agar plates, but this particuliar minicircle vector has very poor transformation efficiency in all strains tested. 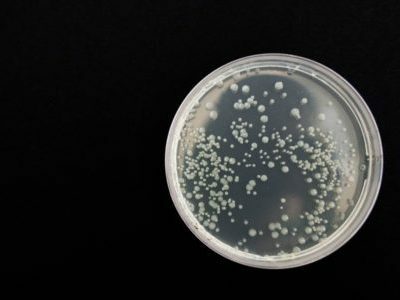 Two to four colonies per plate were picked and inoculated in 2.5 ml LB media and selective for kanamycin-resistant bacteria. 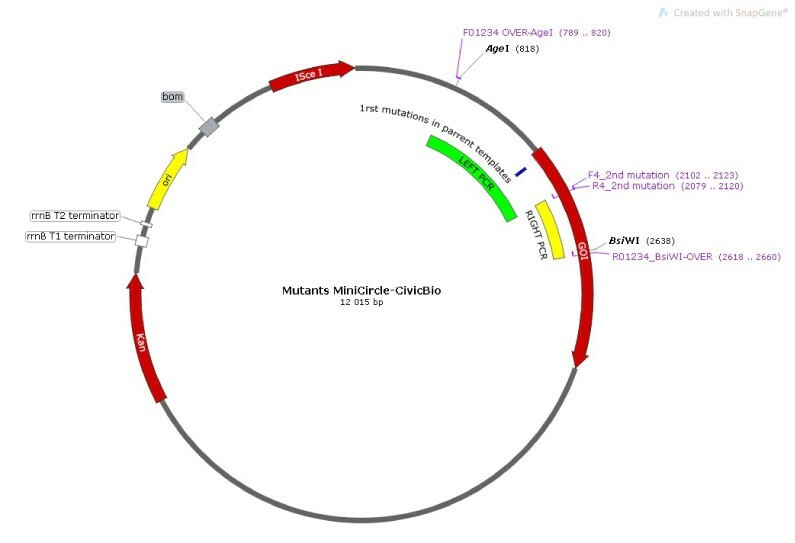 An aliquot of 850 ul was reserved for the glycerol stock and the remaining bacteria (≤ 1.65 ml) served for plasmid DNA extraction using FAPDE-300 from Favorgen. 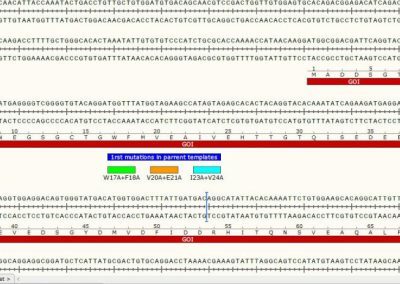 The DNA was eluted in 50 ul EB solution. Incubated 15 min at 37 °C. 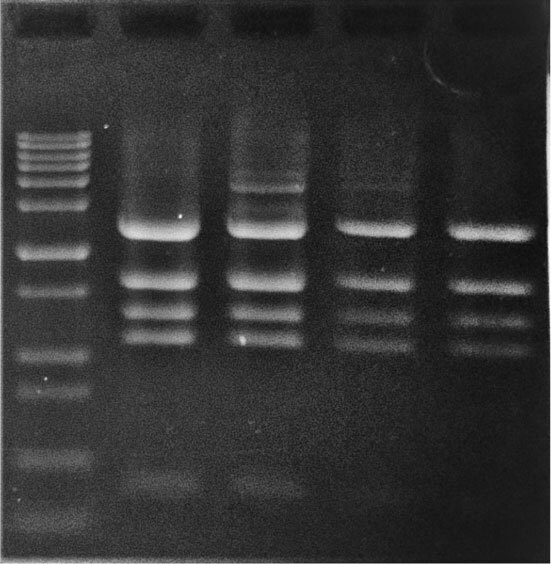 Agarose gel electrophoresis of 4 cloned minicircles after restriction enzyme treatment. 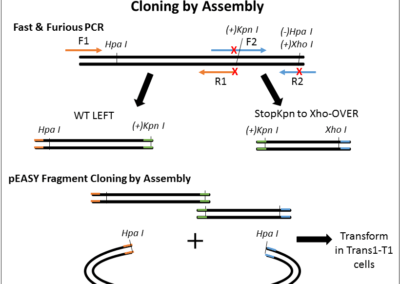 One or two clones were sent at the Plateforme du Séquençage du CHUL for Sanger sequencing. 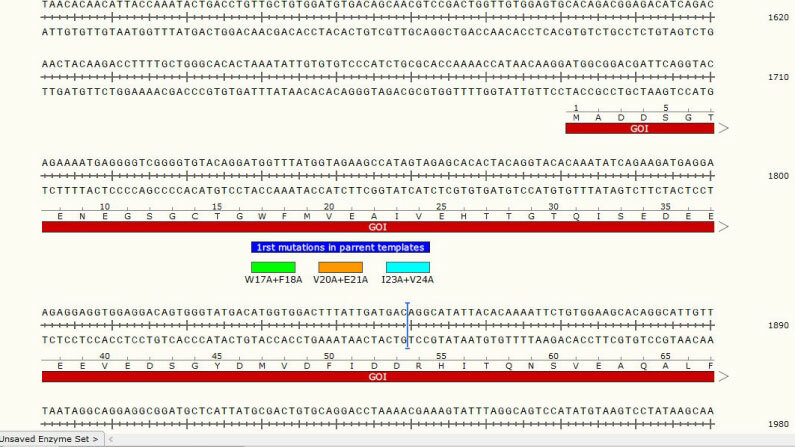 Sequences were aligned and chromatographs analyzed using Snapgene. Want your PCRs to be easy ?